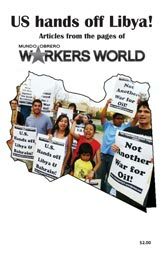 Pam Africa demands treatment for Mumia, May 7. 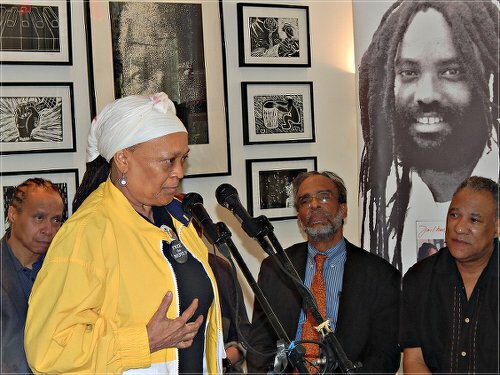 An important news conference was held in Harlem, N.Y., on May 7 to continue the national and international campaign pressing for emergency medical intervention for U.S. political prisoner Mumia Abu-Jamal. An array of speakers demanded Abu-Jamal be diagnosed and receive immediate treatment by physicians outside the prison system. “The need for independent medical diagnosis and treatment for renowned political prisoner Mumia Abu-Jamal is urgent. “An open letter was delivered on April 29 to Pennsylvania Governor Thomas Wolf and Department of Corrections Secretary John Wetzel in Harrisburg documenting the medical neglect and malpractice that has characterized Abu-Jamal’s treatment. “Over a period of four months, Abu-Jamal’s initial skin problem, diagnosed by the prison doctors as eczema, deteriorated drastically, and his health condition became life threatening from undiagnosed diabetes as he went into diabetic shock in the prison. Participants demanded Gov. Wolf and Secretary Wetzel immediately allow outside doctors of Abu-Jamal’s choosing to conduct the proper diagnosis and treatment to save his life. Speakers included Pam Africa, of International Concerned Family and Friends of Mumia Abu-Jamal and MOVE; Noelle Hanrahan, executive director of Prison Radio; Joseph Harris, M.D., of MD’s for Mumia; Larry Holmes of the People’s Power Assembly; Jamal Joseph, professor of Film, Columbia University; Juliette Seydi, assistant for International Affairs for the mayor of Saint-Denis, Didier Paillard, Comite Mumia Saint-Denis; Estela Vasquez, executive vice president, Local 1199 Service Employees union; and Cornel West, professor, Union Theological Seminary, and professor emeritus at Princeton University. Dr. Suzanne Ross of the Free Mumia Abu-Jamal Coalition (NYC) further stated in a media advisory: “Supporters of Abu-Jamal note [in the open letter] that the horrific medical care he has received at SCI Mahanoy with serious consequences is by no means unique to him. They call for an independent investigation of the Pennsylvania Department of Corrections medical system. They note that this investigation must focus in particular on profit-making organizations hired by the Department of Corrections that place priority on cost cutting rather than the quality of care provided to prisoners. Fewer referrals to hospitals are made, and deaths increase. A video of the press conference can be found online at youtu.be/Wat71Z_tl8o. For information on how to help in the campaign for immediate lifesaving medical care for Abu-Jamal, call the hotline at 212-330-8029 or visit freemumia.com. Join officialmumiaabujamal on Facebook.